At All Storm Solutions, we want to ensure that your family is protected from all kinds of storm damage and wind damage. In the Chicago area, storms can be especially dangerous for your home, and we want to ensure that your family stays safe. We provide repairs for all kinds of damages that may occur during a storm. Our specialists are extremely knowledgeable about roofing and siding, and we will know exactly how to repair it quickly. We could also advise you on the best ways to prevent storm damage through quality construction products. Ask our specialists any questions you may have about the damage and your repairs. We are always here to help; just give All Storm Solutions a call! All Storm Solutions has been the #1 hail storm repair company in the Chicago area for over 20 years. 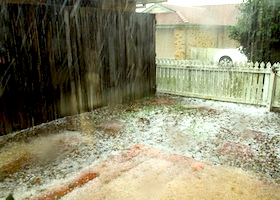 Large hail stones can crack and damage your roof's shingles and your home’s siding. Repairs will need to be made immediately to prevent any more damage that could be done to your home. Look no further when you need immediate restorations on damage left behind from a hail storm. 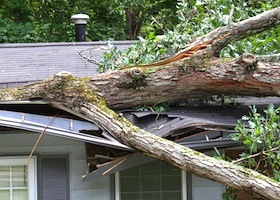 Severe wind can lead to large trees and debris falling on and damaging your home. Wind could also rip off your roof's shingles or shakes and could even blow off siding from your home. A damaged home could be very dangerous, and your safety is our number one priority! Our professionals are experts in wind damage repairs and will make sure your home can withstand storms in the future.